Current status: Bridleway; all of it is physically open and available for use by riders. Strategic significance: This path forms part of two of the community circuits planned by the Trust and BHS for the area: the Aldenham Parish Ride and the Shenley Parish Ride. As part of the Woodhall paths scheme, the owner of the Woodhall estate kindly dedicated the section of Shenley 10 that fell on his land. Hertsmere Borough Council owned the remainder of the route and were happy to have a bridleway, but were unable to make a dedication, so the County Council made a public path creation order to put the path in place. This was confirmed in December 2016, so completing the route. 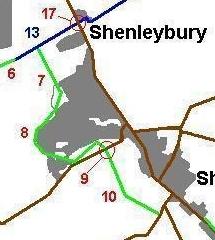 The Shenley 10 Creation Agreement 2013 between Mr Cohen (landowner) and the Hertfordshire County Council upgraded the length of the Shenley 10 footpath in Mr Cohen's ownership to bridleway. The Hertfordshire County Council (Shenley 10) Creation Order 2016 upgraded the footpath in the ownership of Hertsmere Borough Council to bridleway. Order confirmed 9 Dec 16. Commences from Woodhall Lane (public road) at TQ 1902 9997 then continues generally NW for approx 130m to a junction with Shenley FP 11 then continues generally NW and N for approxx 795m to join Radlett Lane opposite Shenley BR 38 at TQ 1850 0066 SW of Wilton Farm Cottages. Limitations:The right of the Owner to erect and maintain two sections of fencing or two bollards such that the clear width of the BR between them is reduced to no less than 1.53m at or within 4m of TQ 1850 0066 and at or within 2m of TQ 1869 0019 as referred to in the Shenley 10 Creation Agreement 2013, save that any such fencing or bollards be situated within the Land as defined in the Shenley 10 Creation Agreement 2013. The right of the Owner to maintain the existing fence running along the inside of the western edge of the BR between TQ 1850 0066 and TQ 1851 0049 as referred to in the Shenley 10 Creation Agreement 2013 until the existing hedge is dense enough to hold stock or 8th May 2018, whichever is the sooner but leaving a clear width of at least 3m at all times. Appears on definitive map sheets: 77 and 85. © 2017 Patchetts Green Bridleways Trust. File reference: EC670.